Home » Events and Blogs » Blog » 2016 – your happiest and healthiest year! 2016 – your happiest and healthiest year! Another year, done and dusted. There’s been highs and there’s been lows. Whatever has happened, good or bad, it’s time to look to the future. 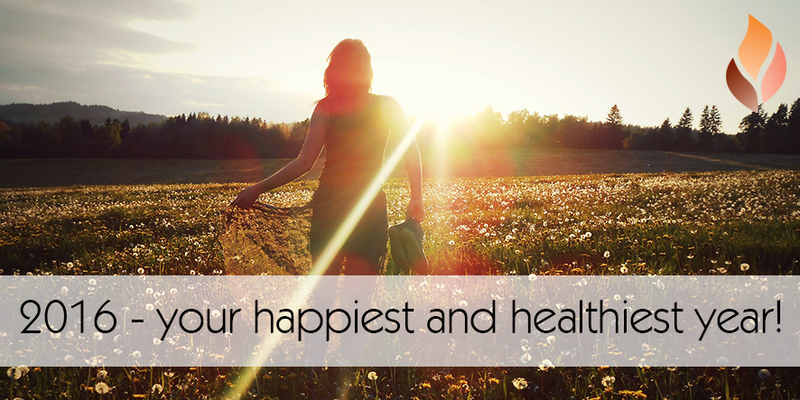 It’s time to look at your 2016, and how to make it the happiest and healthiest year of your life! Stop the stinking thinking. Become aware of your thoughts – are they harmful or helpful? Are they constructive? Encourage thoughts that help you accomplish what you want or need to do. Imagine your ideal 2016. What would your fantastic life look like? How do you make it happen? Visualise what you’d like to achieve. If you have a clear picture, you’ll make it happen. Set goals, but don’t go overboard. Don’t set yourself up to fail. Set realistic goals that will make a positive change to your life. Be mindful not to set too many goals, or you may feel overwhelmed. Focus on YOU and what you’re good at. Try this: focus on building your strengths over trying to fix your weaknesses. If you feel a real need to fix your weaknesses, set strategic goals. However, building your strengths will give you a greater return on investment and a real sense of satisfaction! In 2016, be grateful for all the good things in your life. Focus more on what you have and less on what you don’t have. Express gratitude to others and appreciate yourself. Make a conscious effort to schedule time for yourself in 2016. Do more of the things you love. If you’ve lost yourself in 2015, now’s the time to find yourself again. Embrace change and go with the flow. People change, places change, the world changes and our lives change. Instead of blocking it, go with it. Sometimes change is for the best. Chase it and absolutely embrace it. Smiling boosts your mood and relieves stress. It will not only make you happy, but it will make those around you happy as well. Show more of those pearly whites in 2016! Try something new in 2016. Whether that be an experience, skill, workout or visiting a new place. Shaking things up can bring positivity and change to our lives. It’s hard to detach from situations, issues and complications in our lives, but by letting go of the negative you’ll be bringing more positive into your life.